Happy independence day everyone!!! How about celebrating this beautiful and special day by giving tribute to our mother nation in our own way. 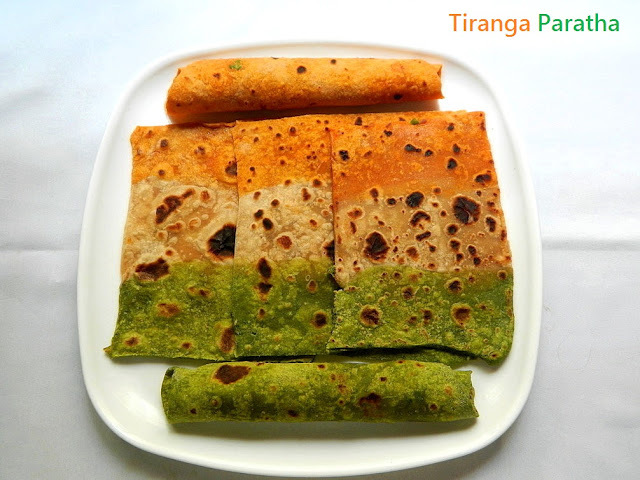 I had this tricolor paratha idea in my mind since many days, was finding for the right occasion to prepare it. I had to cut the sides of paratha to make it uniform in size since the shape it came out after rolling was not exact rectangular. I added carrots for the saffron color, white is the all purpose flour, for green color I used spinach extract. I did not imitate it exactly since it would be difficult for us to have it :) It is just a combination 3 types of plain parathas. We will see the procedure below. Water : is needed for kneading the dough. 1. In a mixing bowl add all the ingredients required for Saffron color dough. Add little water at a time and knead this to smooth dough. Keep it aside. 2. In the mixing bowl add all the ingredients required for white color dough. Add little water at a time and knead this to smooth dough.Keep it aside. 3. In the mixing bowl add all the ingredients required for green color dough. Add little water at a time and knead this to smooth dough. Keep it aside. 4. Let all the dough rest for around 15 mins. 5. Take small lemon sized dough of each type and make it rectangular size as shown in d pic. Attach them together side by side. 6. Roll this like chapati/roti from both the sides horizontal and vertical side. See that all the rolls are spread evenly. 8. On a frying pan apply little oil and toast the spared dough and toast well on both the side. 9. Serve this with peanut chutney and curd / pickle. You can also add red chili powder / green chili if needed while kneading the dough.